Wedding Earrings. Brides put a lot of thought into the gown they’ll wear, the headpiece they’ll choose and the bouquet they’ll carry but earrings can also have a huge impact on your bridal look. From statement to studs, these pieces of jewelry are transformative. Gold statement earrings are for a bride with flair. These ornate gold earrings feature numerous stones in a creative setting that are perfect for a bride wearing a more simple neckline or planning a gold-inspired wedding. Similarly, small gold diamond halo stud earrings can bring the bling in a more diminutive way. For brides who want a little pizzazz but don’t want to take any attention away from their gown and headpiece, shiny gold studs are a great choice. Teardrop earrings are a style that will never go away when it comes to classic bridal accessories. These sapphire teardrop earrings are showstoppers and perfect for a bride who’s feeling blue on her big day. 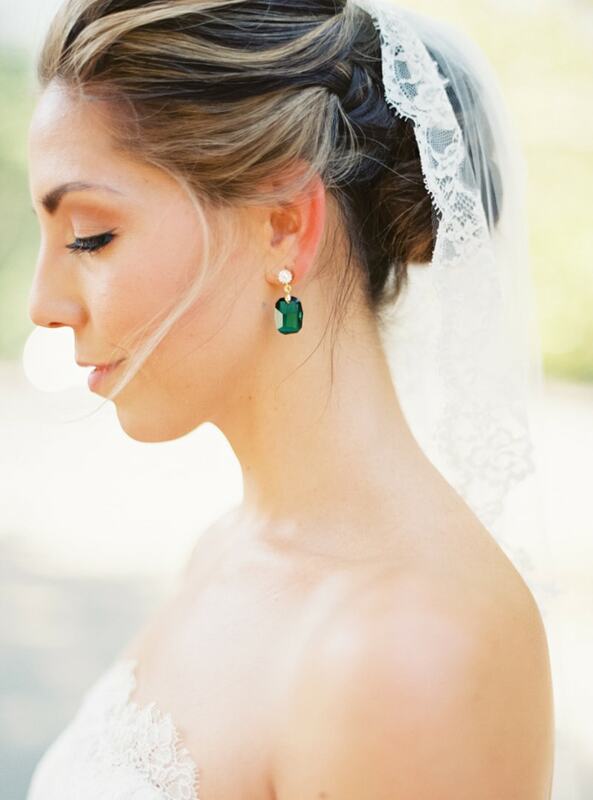 Emerald is a bold color choice but it’s so perfect with a white wedding gown. These statement emerald earrings feature large cut stones anchored with a diamond stud base. For the bride with a more luxurious look in mind, these elaborate silver earrings are keepers. Their long and ornate teardrop settings are perfect for brides with updos and strapless necklines. 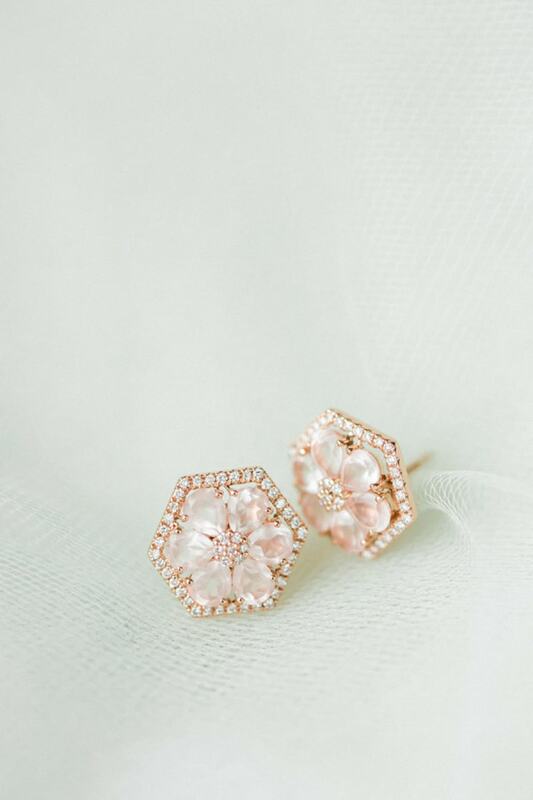 Rose gold is a huge jewelry trend right now and this pair of rose gold floral-inspired stud earrings are perfection. This style is ideal for a romantic, lace-inspired gown. Sometimes, a gorgeous set of antique earrings can make all the difference. 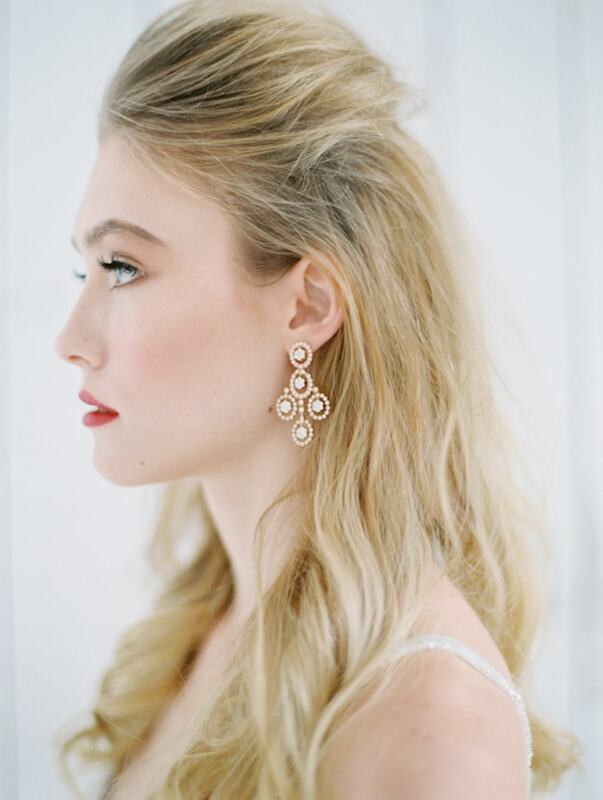 If a bride chooses a gown with timeless touches or even wears a family heirloom piece, these chandelier gold and pearl earrings will bring the entire look together. And for a classic touch, these beaded stud earrings are great for brides who want to complement their updos. This seamless hairstyle looks extra beautiful with these impressive baubles. Don’t overlook your wedding earrings! They can give your look that one final touch that makes everything come together.